When I think of talcum powder I am transported back to my Nana's bathroom throwing it in the air in huge clouds with my brother. My Nana always had the fresh smell of talc and lavender so it always makes me nostalgic. I think it is an under rated product that too many people have forgotten about, when in fact talc has sooo many uses. When I saw Vanilla Puff in my local Lush store that nostalgia wrapped me up but with a modern twist. 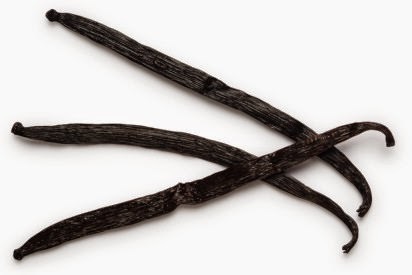 Vanilla is a favourite smell of mine, if I am buying candles I am always swayed by Vanilla scents combined with a promise of a blend of tonka, jasmine and vanilla which is fair trade, Vanilla puff was quickly in my basket. One of the things I love about Lush is knowing that the products I use are ethically sourced and helping workers in another country. I also love the simplicity of ingredients there are only 9 in Vanilla Puff which is refreshing. 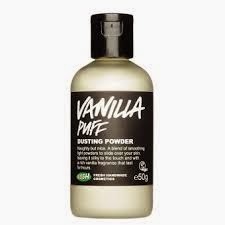 The most obvious use for Vanilla Puff dust is to use after a bath or shower. It can help balance out excess oils and soften skin. A little goes a long way. A little 50g bottle lasted me for months and left my skin soft and smelling delicious like I had been wrapped up in a cloud. I don't just use my puff on myself I also put some on my pillow just before I put on fresh sheets just a tiny bit to get a nice scent.You can do similar with towels or I even used the last bit on my carpet which I left for a little bit and then hoovered up to get a lovely scent in the room. The only real downside to the Vanilla Puff is the price at £4.95 there are much cheaper talc available on the market which means some people may not give it a go. It sadly means when I am in Lush on a budget I will pick up a new bubble bar instead not because Vanilla Puff isn't dreamy but I tend to only treat myself from Lush these days. However if you are looking for a talc I urge you to try Vanilla Puff it lasts a long time so it is good value and it smells delicious.